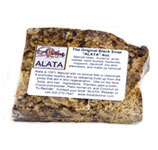 The Original Black Soap "ALATA"
Our Alata Soap is "The Original" recipe of our Ghanaian ancestors. It is often imitated, but never duplicated by soap manufactures around the world. It is the natural process that makes the Alata Soap a natural wonder. We made the Original Soap into a soft paste and a liquid for the convenience of our customers. We kept the tradition of using only natural ingredients in our final product. The Liquid can be used as a body wash or shampoo. The soft soap is used for the face and the body and can be conserved if used with a loofah sponge. 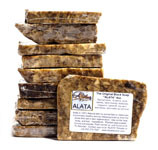 Of the three types of Alata Soap we sell, the Alata Bar is the most popular among our customers. After all, it is "The Original." Use Alata Soap to keep your skin healthy and vibrant. It works on all types of skin!